Over the past few weeks, we’ve talked a lot about getting your book set up on different stores, formatting, and ways to help maximize your visibility. Today, we’ll be sharing some author website tips, and the best ways to maximize your visibility outside of eBookstores. You know Shakespeare never had to worry if williamshakespeare.com was already taken, but today’s authors should act quickly to claim their domain name. If you’ve decided to go with a penname, that makes it a little easier: simply pick a penname that doesn’t have an active site associated with it. If you’re going with your own name, then that might present additional issues. The important thing is to have a dedicated URL for your author site, whether it’s JohnDoe.com or JohnDoeAuthor.com or JohnDoeBooks.com. Why? Because it gives a level of legitimacy that JohnDoeAuthor.wordpress.com doesn’t. Unless you’re George R.R. Martin who famously uses LiveJournal to communicate with his fans, you’ll want to make sure you purchase a domain. Need some tips on domains or any of the technical stuff discussed in this blog? We can help! See our form at the bottom of the page. WordPress vs. Blogger vs. Wix vs. ? Once you’ve got a domain, the next step is to set up your hosting provider. What does that mean exactly? Think of your author website as a folder. In order to display images and content, you need a folder to stick it in and you’ll need to pay someone to host that folder on the internet. For some services, like Wix, Blogger, and SquareSpace, the hosting is bundled in when you get the service. But along with that comes limitations on customizations. For our money, we like to use WordPress (note: wordpress.org is not the same as wordpress.com). Using WordPress means we have to pay for a hosting provider (we use BlueHost) and install the website ourselves. But we also have access to a vast array of plug-ins that do pretty much anything we need. We’ll talk more next week about our favorite WordPress Plug-ins for authors. Once you’ve got your website set up, it’s time to focus on what it’s going to say. 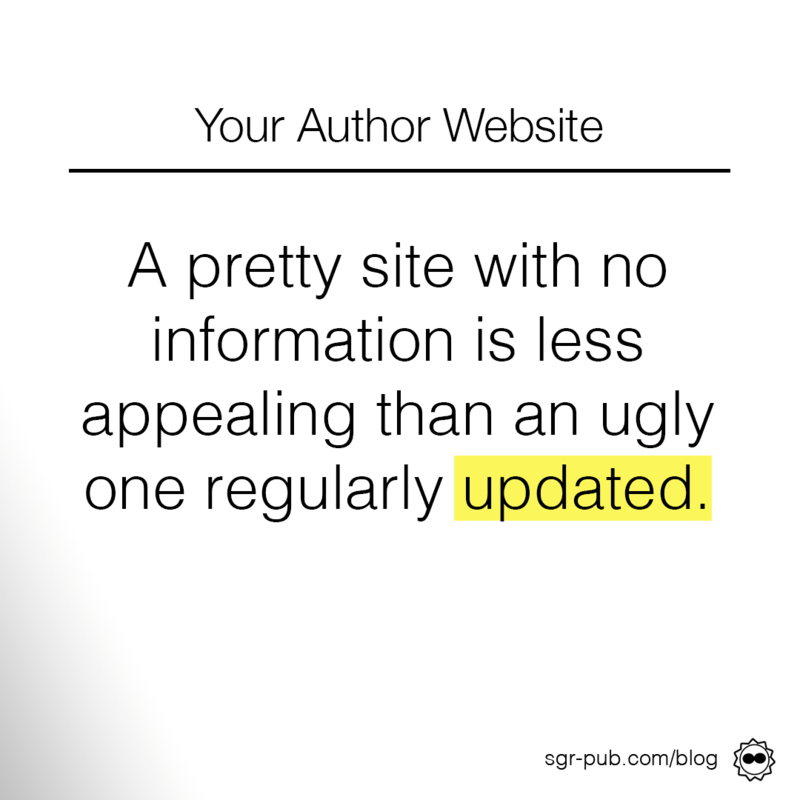 Think of your author website homepage as the first impression for readers. There are various theories on what a home page should contain, but you should absolutely make sure it’s search engine optimized (SEO). We’ll have a later blog on what that means. Site visitors should have easy access to your book pages (more in a bit), social media links, email, and newsletter sign-up form. Speaking of newsletters, don’t be one of those people who block your author website homepage with an annoying sign-up screen. You’ll lose more readers than gain subscribers. You should also take care how quickly your site takes to load. Optimize images (that is, make them as small as possible) and avoid using background images, video, and music. A pretty site with no useful information is less appealing than an ugly site that helps users get to where they want to go. Obviously, your goal is to strike a balance of pretty and functional. But if you have no content, then your site will languish. At a minimum, you should have pages dedicated to your published (and forthcoming) books, complete with links to every store they’re available on. 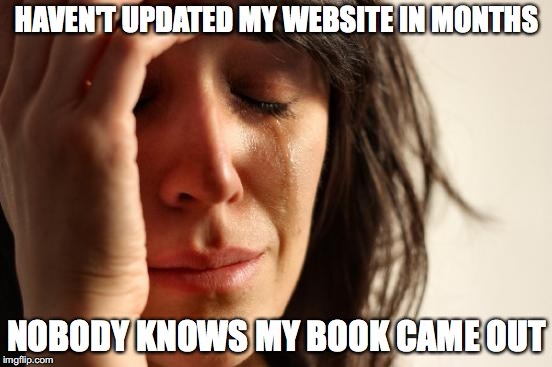 MooBerry Book Manager has a great WordPress plug-in for this. You should also have pages for your biography, complete with your head shot and social media links, as well as appearances and news. A blog is also highly recommended. We’ll talk more about our favorite blogging tips in a future post. After you’ve got your site up and running, it’s important to do routine checks to make sure it’s still running smoothly. This is especially important for new releases, where you’ll need to change “available for preorder” to “available for sale.” This is also a great opportunity to check all your social media and contact links, too.